The overall topical drug delivery market is expected to grow from USD 92.40 billion in 2016 to USD 125.88 billion by 2021, at a CAGR of 6.40% from 2016 to 2021. Major factors driving the growth of this market are the high incidence of burn injuries, rising geriatric population, and increasing incidence of diabetes. Topical drug delivery is a method of drug administration in the body through ophthalmic, rectal, vaginal, and skin as topical routes to achieve its therapeutic effect. The base year considered for the study is 2015, and the forecast has been provided for the period between 2016 and 2021. Growing prevalence for topical drug delivery is the major drivers for the market. Topical drug delivery has the advantage of delivering drugs more selectively to a specific site. Moreover, the use of topical drugs helps avoid fluctuation in drug levels, improves compliance, and facilitates self-medication. As a result, the topical route is preferred over other routes of drug delivery for the treatment of many diseases/conditions. On the other hand, topical delivery involves painless administrations and minimal risk of infections. Considering these advantages, many pharmaceutical companies are developing and launching topical drugs for indications that were traditionally treated using oral or injectable drugs. During this research study, major players operating in the topical drug delivery market in various regions have been identified, and their offerings, regional presence, and distribution channels have been analyzed through in-depth discussions. Top-down and bottom-up approaches have been used to determine the overall market size. Sizes of the other individual markets have been estimated using the percentage splits obtained through secondary sources such as Hoovers, Bloomberg BusinessWeek, and Factiva, along with primary respondents. The entire procedure includes the study of the annual and financial reports of the top market players and extensive interviews with industry experts such as CEOs, VPs, directors, and marketing executives for key insights (both qualitative and quantitative) pertaining to the market. The figure below shows the breakdown of the primaries on the basis of the company type, designation, and region considered during the research study. 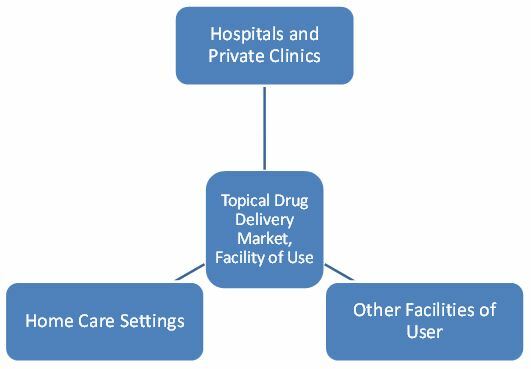 The topical drug delivery market comprises a network of players involved in the research and product development; raw material supply; component manufacturing; distribution and sale; and post-sales services. Key players considered in the analysis of the topical drug delivery market are Galderma S.A. (Switzerland), GlaxoSmithKline plc. (U.K.), Valeant Pharmaceuticals International, Inc. (Canada), Crescita Therapeutics Inc. (Canada), Medpharm (U.K.), 3M (U.S.), Bayer AG (Germany), Novartis AG (Switzerland), Janssen Global Services, LLC (U.S.), and Cipla (India). In January 2017, Johnson & Johnson entered into a definitive agreement to acquire Actelion, a Switzerland-based biotech company, for USD 30 billion. The acquisition gives J&J access to the Swiss group's line of high-price, high-margin medicines for rare diseases. In December 2016, Novartis signed an agreement with Encore Vision, Inc. (U.S.) to acquire the latter’s clinical-stage, disease-modifying, topical treatment for presbyopia. In December 2016, Galderma received approval from the U.S. Food and Drug Administration (FDA) to market Restylane Refyne and Restylane Defyne. In December 2015, Valeant Pharmaceuticals signed an agreement with Walgreens (U.S.) with an aim to extend its distribution model to additional participating independent retail pharmacies. Note: Others facilities of use include research institutes and diagnostic centers. 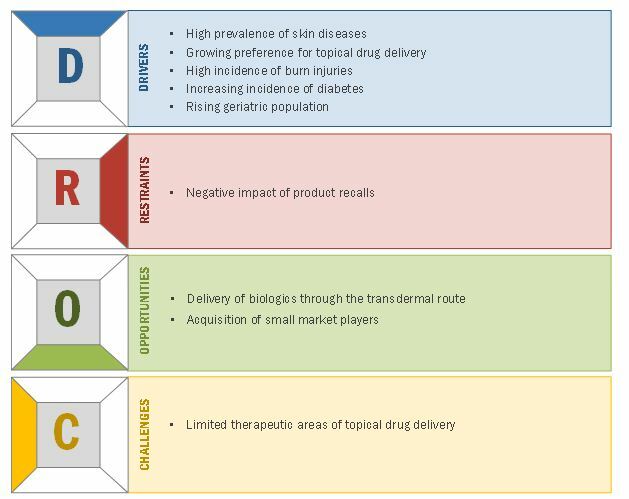 What are new application areas which the topical drug delivery companies are exploring? Formulations to grow at the highest CAGR during the forecast period. Based on product type, the topical drug delivery market is segmented into formulations, and devices. Devices segment is projected to register the highest CAGR during the forecast period. Devices includes transdermal patches and transdermal gels. Devices (Transdermal drug delivery) could replace the injectable mode of delivery required to deliver many new biologic drugs and vaccines. Factors like improved patient compliance, noninvasive nature, elimination of hepatic first pass metabolism, enhancement of therapeutic efficiency, and maintenance of steady plasma level of the drug are contributing to the growth of the transdermal drug delivery devices market. The global topical drug delivery market is projected to reach USD 125.9 billion by 2021. Market growth can be attributed to factors such as rising prevalence of skin diseases, the convenience of topical drugs, high incidences of burns, rising incidence of diabetes, and growth in geriatric population. Product recalls and their negative impacts on the market are expected to restrict the adoption of topical drugs to a certain extent during the forecast period. Growing prevalence for topical drug delivery and rapid growth in geriatric population are the major drivers for the market. Aging is associated with decreased cellular function, which reduces the body’s natural ability to close and heal wounds. As a result, geriatric individuals are major end users of topical drugs for the treatment of wounds. Serious chronic wounds such as pressure ulcers are also very common in the elderly population. 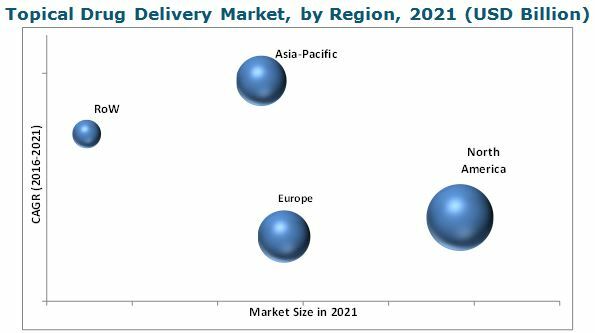 With growth in this population segment, the prevalence of several chronic diseases is expected to increase in the coming years, thus driving the demand for convenient drug delivery options, such as topical drug delivery. However, negative impact of product recalls is restraining the market growth. Hospitals and private clinics form the fastest growing facility of use segment. The dominance of this segment in the topical drug delivery market is mainly attributed to the high incidences of skin diseases and disorders requiring hospital treatment and high incidences of hospital-acquired infections (HAIs). Moreover, increasing healthcare spending on drugs in many developed countries is further driving the growth of this segment. Home care is primarily targeted at patients recovering after a hospital stay or those who need additional support to avoid unnecessary hospitalization. The wide home use of a variety of topical drugs is a major driver of market growth in this segment. This segment includes academic & research institutions and diagnostic centers that use various topical drug delivery technologies for research purposes or to perform tests. Product recall is a major concern in the industry, when will this scenario ease out? Emerging countries have immense opportunities for the growth of topical drug delivery manufacturers, will this scenario continue? Most of the manufactures have opted new product launches and approvals as the key strategies as could be seen from the recent developments. Where will it take the industry in the mid to long term? The topical drug delivery market is expected to reach USD 125.88 billion by 2021 from USD 92.40 billion in 2016 at a CAGR of 6.4% during the forecast period. Major factors driving the growth of this market are the high incidence of burn injuries, rising geriatric population, and increasing incidence of diabetes. Topical drug delivery is a method of drug administration in the body through ophthalmic, rectal, vaginal, and skin as topical routes to achieve its therapeutic effect. The topical drug delivery market has been segmented, on the basis of product type, into formulations and devices (transdermal drug delivery). Transdermal drug delivery is expected to offer lucrative growth opportunities and represents a new revenue pocket for market players. This is because transdermal drug delivery offers enhanced therapeutic efficiency and helps maintain a steady plasma level of the drug. The topical drug delivery market in APAC is expected to grow at the highest CAGR during the forecast period. The high growth in the Asia-Pacific market can be attributed to the rising geriatric population, increasing healthcare expenditure, rising disposable income, and growing focus of global pharmaceutical companies on the markets in emerging APAC countries. What are the upcoming industry applications for topical drug delivery? In February 2016, GlaxoSmithKline Philippines voluntarily recalled more than 30 batches of its topical antibiotic cream—Mupirocin Calcium 20 mg/g Cream—due to particulate contamination, including glass particles and rust and paint chips. In January 2016, Noven Therapeutics (U.S.) voluntarily recalled three strengths of the Daytrana patch. This recall resulted due to the fact that some Daytrana patches did not meet the release liner removal specification. These frequent product recalls are not only creating negative branding for topical drug products but also are resulting in the delayed acceptance of new drugs manufactured by a company whose product has earlier been recalled from the market. This is not only affecting the profitability of companies but also the adoption of topical drug products to a certain extent. Key players in the market include Galderma S.A. (Switzerland), GlaxoSmithKline plc. (U.K.), Valeant Pharmaceuticals International, Inc. (Canada), Crescita Therapeutics Inc. (Canada), Medpharm (U.K.), 3M (U.S.), Bayer AG (Germany), Novartis AG (Switzerland), Janssen Global Services, LLC (U.S.), and Cipla (India). These players are increasingly undertaking mergers and acquisitions, and product launches to develop and introduce new technologies and products in the market.